Opening the kiln’s door during heating will cause the temperature to drop quickly. Temperature recovery to your set point temperature is rapid. These kilns do not have a silent relay. I fire at 1400 degrees on average and I can open the door, place my jewel in side, close the door and the temperature has regained my set point in 1 minute. I know this because it clicks and as it heats and stops because it is at temperature. It is always after one minute. This is true of the 55F and the 66F series. The larger ones can take a tiny bit longer. to 3 – 3.5 and remain there the rest of the day. If you turn the pyrometer to high and walk away you can BURN IT UP. With 120 volts and 1600 watts, is what allows this guy to heat fast and regain it’s temperature quickly when opening the door to check your work. I can offer a lower volt and watts for those of you that fell you are more comfortable with a slower to temperature kiln. Simply let me know in the instruction section of your order. I have had artist say my kilns are too hot. After a lot of research I have come to realize my kilns are solid, thick walls small chambers. They regain their temperature in 1 minute! I believe enameling artist are used to kilns that take longer to regain temperature. They start calculating how long an enamel jewel has been in the kiln and in most kilns I have tested they do not regain temperature in 1.5 minutes. At this time the kiln is still below the set point temperature. So artist think if they fired in their old kiln for 1.5 minutes and up it would be the same here but they over fire their jewels. In my kilns fast, hot and of great quality. The TEC220 Three-button Controller is a highly accurate and customizable instrument. In this installation, the controller’s basic setpoint functions are used to reach your target-temperature rapidly. 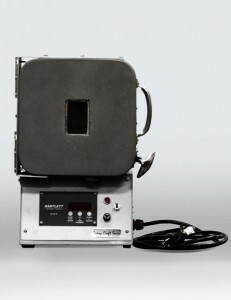 Once plugged in and after an initial startup sequence, the controller displays the current interior kiln temperature in degrees Fahrenheit (°F). With the “ELEMENTS ON” toggle switch in the UP/ON position, the kiln will immediately begin to heat and will seek the last set target temperature. With the toggle in the off position, press the SET key (first key on left) displays SPI. Press the center key to display the set temperature, and adjust using the “UP” or “DOWN” Arrow keys. Pressing again will display “SP2” which indicates a default safety over-temperature limit. Press again to displays “H100” Factory set to keeps the unit from over firing. Press the set key again to display the current temperature. Be aware that the kiln’s elements are “ON” and may have live 120 volts to them when the toggle is in the UP/ON position. Always flip the toggle to the “elements off” when finished firing. 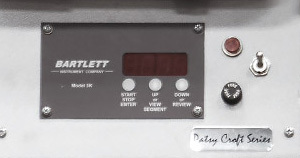 The Model 3K controller with RMPATE software has four User programs. Each program can have up to eight segments with each segment consisting of a ramp rate (in degrees per hour), a target temperature, and a hold time. Programming consists of choosing the User program (1, 2, 3 or 4), choosing how many segments you want (up to 8), then programming the ramp (rA), temperature ( °F), and hold time (HLD) for each segment. When the power is first turned on either ErrP or IdLE alternating with the current temperature is displayed. If ErrP is displayed press the up arrow to clear this error message. If IdLE alternating with the current temperature is displayed, you are ready to begin programming. Press ENTER to begin. The previously fired program will be displayed, either USr1, USr2, USr3, or USr4. Select the user number you want to program by using the UP and DOWN keys, and press ENTER. dELA is displayed alternating with 00:00. Press ENTER if no delay is wanted. When firing glass no delay is used. Use the UP and DOWN keys to delay the start of the firing (Hours: Minutes). Press ENTER when the desired delay time is displayed. SEG alternating with the last selected number of segments is displayed. Use the UP and DOWN keys to select the number of segments, then press ENTER. NOTE: Each segment consists of a ramp rate to a temperature and a hold time. There are 8 segments available for programming. rA 1 alternates with the ramp rate ( °/hr). Use the UP and DOWN keys to select the desired rate and press ENTER. A rate of 9999 will cause the kiln to heat (or cool if in a down ramp) at maximum rate. The first segment must always be an “up” ramp. °F 1 alternates with the currently selected temperature. Use the UP and DOWN keys to select the desired temperature for this segment and press ENTER. HLd1 alternates with the currently selected hold time. Use the UP and DOWN keys to select the desired hold time for this segment and press ENTER. This completes programming for the first segment. If more than one segment was chosen then rA 2 will be displayed and you repeat the steps for ramp rate, temperature, and hold time for each additional segment selected. rEdl will be displayed after the last segment is entered. Press START to begin firing. Press ENTER – the display will show Usrx, where “x” is the last fired program number. Press ENTER – SEG/000x will be displayed, where “x” is the number of segments previously in the program. Press ENTER – the display will show rA 1/xxxx, where “xxxx” is the last saved rate for ramp one. Press ENTER – the display will show °F 1/xxxx, where “xxxx” is the previous segment 1 temperature. Press ENTER – the display will show HLd1/xxxx, where “xxxx” is the last saved hold time. Repeat steps 6 – 12 filling in the information for each additional segment from the table. To re-fire the last used program, press the DOWN key when IdLE is displayed. The program will be quickly reviewed and rEdl will be displayed. Press START to begin the firing. During a firing you may advance from the current segment to the next ramp rate by using Skip Step. If you are in a hold period you may add time or add temperature to the hold period. Displaying the current set-point and accessing the following options When the UP key is pressed during a firing the current ramp or hold is displayed followed by the current or traveling set-point, then SStP is displayed. If you do not press a key within several seconds the display will return to showing the current temperature in the kiln. Skip Step This option allows you to skip from the present segment to the next ramp rate. Press the UP key, the display will show the current segment, then the set-point, then SStP. When SStP is displayed press ENTER to skip to the next ramp rate. Add Time to Hold Period This option allows you to add time in 5 minute increments to a hold (soak) period. 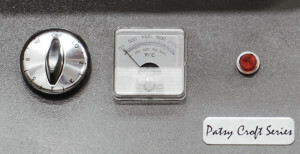 When in a hold period (during a hold or soak, the temperature in the kiln will be alternating in the display with the remaining hold time), press the UP key. When SStP is displayed press the UP key again and tME will be displayed. Press ENTER and 5 minutes will be added to the hold time. You may use this procedure as many times as necessary to get the hold time that you want. Add Temperature to Hold Period This option allows you to add temperature in 5 degree increments to a hold (soak) period. When in a hold period (during a hold or soak, the temperature in the kiln will be alternating in the display with the remaining hold time), press the UP key. When SStP is displayed press the UP key twice more and tMP will be displayed. Press ENTER and 5 minutes will be added to the hold time. You may use this procedure as many times as necessary to get the hold temperature that you want. Err1 Error 1 indicates the temperature in the kiln is rising during an up ramp slower than 15 °F/hr. If this rate continues for 8 minutes the firing will be stopped. Err1 may be an indication that the elements are worn or that a relay has stopped working. ErrF Error F indicates the temperature in the kiln is decreasing during a down ramp less than 15 °F/hr. If this rate continues for 8 minutes the firing will be stopped. ErrF may be an indication that a relay has stuck in the on position. Errd Error d indicates that the kiln temperature is 100 °F above the traveling set-point, which is the current desired temperature in the kiln. The traveling set-point will increase or decrease according to the programmed rate. Errd may indicate a relay stuck in the on position or a problem with a thermocouple not reading correctly. ErrP ErrP is displayed whenever there is a power interruption that is long enough to stop the firing. If the power interruption is brief the kiln will continue to fire when power is restored; in this case there will be no indication of a power failure. To clear the error, press any key. tC FAIL tC alternating with FAIL indicates the thermocouple has failed. Replace the defective thermocouple. To clear the error, press any key. tC- – The red and yellow thermocouple wires are reversed. CPLt Firing Cycle Complete (firing time is alternately displayed). dELA Delay. Displays when entering the delay time (hour:minutes) until the start of the firing. DLy Delay. Alternates with the remaining delay time until the start of the kiln. °F # Segment temperature in °F – Set temperature for a user program. °C # Segment temperature in °C – Set temperature for a user program. A decimal point will display in lower right corner. Err1 Error 1, kiln was heating less than 15°/hr and it has been stopped. Errd Error d, kiln temperature is 50° hotter than the set-point temperature. Kiln has been stopped. ErrF Error F, similar to Err1 but during a down ramp the temperature is decreasing less than 15°/hr. Kiln has been stopped. ErrP There has been a power interruption that has stopped the firing. Press any key to clear. FULL Beeps continuously at end of firing until a key is pressed. HLd# Soak time in hours:minutes at a hold temperature. IdLE The kiln is at idle and ready to be programmed. Idle alternates with the current kiln temperature. OFF No beeping when firing is complete. On Beeps for 15 seconds at end of firing. rEdl Ready to fire current program. Press START to begin firing. SEG Short for Segments. You can enter up to 8 segments in a program. USr # User program number displayed.